I knew it was going to be a cold one so while I brought a ton of choices, I decided on my flow tights, singlet and arm warmers (all Oiselle). I made a last minute decision to add my wazelle short sleeve top under my singlet and that was a good choice. We were fortunate to have great friends to crash with while we were in town and enjoyed spending the weekend with them. Once we made it into town Friday afternoon we headed to the expo, which was packed! However, it was very well organized and we were able to get our bibs, shirts and bags quickly. We hung out for a bit, did a tiny bit of shopping and ran into our friends from DC (my former coworkers) who were running the 8k and the marathon. There was a really cool blown up sign highlighting the route we’d take the next day. I snapped a quick pic because I love those things! Then we headed to our friends’ house, ate some pizza (carbs! ), laid out our gear and turned in pretty early. Race morning came quickly (as they always do) and the weather forecast was completely accurate — it was a balmy 27 degrees when I woke up and I don’t think the temp rose above freezing until we were a few miles into the race. Anyway, I had my tried and true Larabar for breakfast – SO yummy and sliced my apple for my fuel while running. Soon, it was time for us to head to the start. It was really easy for us to park and make our way over to the start. The half marathon was starting as we got there and we had enough time to duck into a nearby hotel (actually the hotel K and I stayed at last year) and use the restroom / keep warm. I had meant to get in a short mile warmup, but once we left the hotel, the race was starting. We snapped this quick selfie and then started! We started off with a pretty solid 10:07 mile pace and mile two clocked in at 10:09. I actually wanted to keep it right about that range for the whole race, but the next few miles were a bit faster. I’m not going to recap every single mile because there are SO many of them, but miles 3-9 were all sub 10. Mile 4 was actually my fastest mile and I think that was because right smack in the middle of it, I realized that Bart Yasso was cheering on the sidelines! I got so excited and yelled “Bart! !” and he said “looking strong” and we high fived. It was a total moment. I definitely picked up the pace after that fun exchange. How cool, right? Yeah. Pretty awesome. Around mile 10, I finally warmed up and stuck my gloves and my ear wrap in the pocket of my camelbak (a decision I would later regret). The sun was shining, I was feeling great and I was running with my friend and my husband. We were right on pace for a 4:30ish finish…but of course, if you’ve seen my posts on Instagram and Facebook you know that didn’t happen…and I actually didn’t really mind (well, I did some…). Come back TOMORROW and read about the rest of the race, why I wish I’d just ditched my ear wrap and why I had SUCH a blast even though the race didn’t turn out at all like I expected! Did you race this weekend? How’d it go?? Have you ever met Bart Yasso?! I high-fived Bart around mile 4 too! And we basically wore the same outfit! HA! So nice to meet you (finally!) after the race! Looking forward to reading part two! The weather was tough this week! I love that you have a great attitude about how things turned out. Sometimes when things don’t go as planned they end up okay anyways. I’m happy you finished and were able to run with your husband! Congrats congrats congrats! So happy for you friend! Tried tracking you via mobile – but as you probably heard there were technical difficulties – luckily we had some live tweeting by Julie 🙂 You guys look so happy in the pre-race photo and pretty awesome Bart gave you a complement! Can’t wait to read the rest… now I know how you felt while reading my novella (give me more please haha). That’s the thing about the marathon, you can be as prepared as can be but we never know what those 26.2 miles will bring us race day! Way cool on Bart Yasso!!! I’ve met Bill Rodgers at the OKC marathons and that was cool but I didn’t get a high five. Super cool Courtney! Looking forward to tomorrow’s post. Jess@Flying Feet in Faith recently posted…#MotivationalMonday Celebrate!! Congrats! So cool you got a high five from Bart! That would put some pep in my step as well! It is nice to see you are staying positive about this even though it wasn’t what you wanted. You still ran a freaking MARATHON and that is awesome!!! Can’t wait to read the rest!! How exciting that you got a high five from Bart! Sorry to hear that the race didn’t go as you’d planned, but it was so cold this weekend that just getting out there and running was an accomplishment in and of itself. And you got to cross the finish line with K as he finished his first marathon…yay! yeah, it wasn’t what i planned for, but who plans for awful awful cramps? no one. but once i accepted that the cramps were there for the rest of the race, i had a good time! I have met Bart Yasso, I got the chance to chat with him and take a pic at the Shamrock expo last year! Very cool guy! So, let’s chat about your mid run fuel…you are using apples? Yep. I ate apple slices during all of my long runs. Loved it!!! Congratulations! The cold definitely threw me for a loop on Saturday morning and I ended up wearing a very thick hat. It was odd how when the sun was shining it wasn’t freezing cold, but the second you got in the shade it got cold QUICK! Yes like along the river – that was cold!!!! Exciting, and congrats! It’s tough when races don’t go as planned but you seem really happy (and not just fake happy) about the race and weekend 🙂 I can’t wait to read the rest of your recap! Tried tracking you during the race but no luck – was that an issue that affected all Richmond runners? Oh yeah – the tracking was all jacked up. It didn’t work for anyone. And thanks – I was really happy to share the entire experience with my husband. That meant the world to me! How awesome that you met Bart! One day I hope to meet him. Sorry the race didn’t go as planned. Looking foreward to reading part 2! It’s so interesting reading the marathon experience at the race! I was really impressed with most aspects of the half and thought it was really well organized. I ditched my gloves around mile 5 or so and regretted it later too. I don’t think I really felt warm until around mile 9 or 10. So, how’d it go??? Don’t you love the swag?! Awesome recap so far! 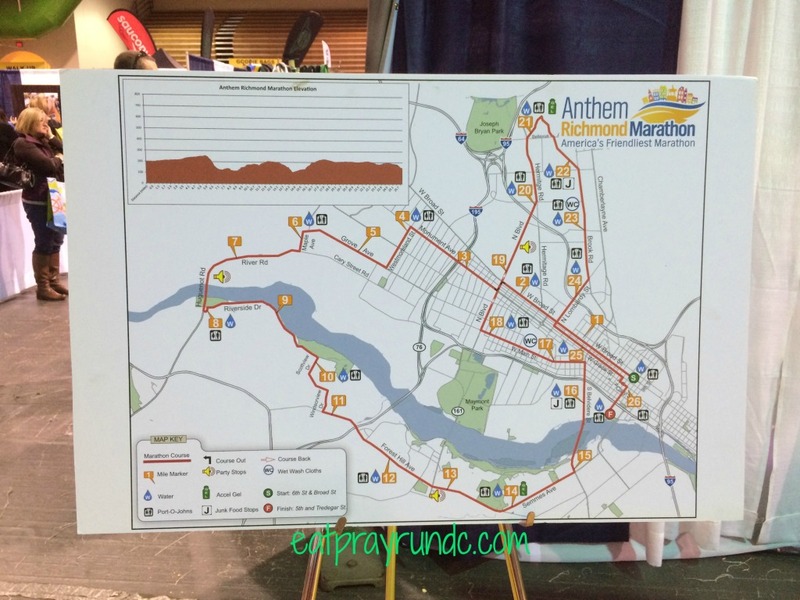 I also ran the Richmond Marathon and am working on a race recap as well… it was a COLD one, for sure! My running buddies and I attended Bart Yasso’s talk on Friday evening at the Expo and had the opportunity to meet him afterwards! What a cool, humble, down-to-earth guy! Can’t wait to read more about your adventure this weekend! Makes me so happy you got to experience this with K! Sorry the race itself didn’t turn out the way you wanted initially but you have such a positive spirit and are now a 3x marathoner. Woot! What a cool moment!! Loving the recap so far, can’t wait to hear the rest! Dang girl! Way to leave me hanging….I need all the dirty details! Proud of you for sticking it out and having such an amazing attitude even though things did’t go the way you hoped! Congrats on your 3rd marathon! Even if it wasn’t the race you were hoping for, that is pretty awesome. Apparently Bart Yasso was at the finish line of the NYC Marathon a few weeks ago but I didn’t see him! Thanks Gabby!! I feel good knowing that pre-cramps, I was on track for a great race! 27 is just downright cold. At least you were running. haha, yeah it was pretty ridiculously cold! 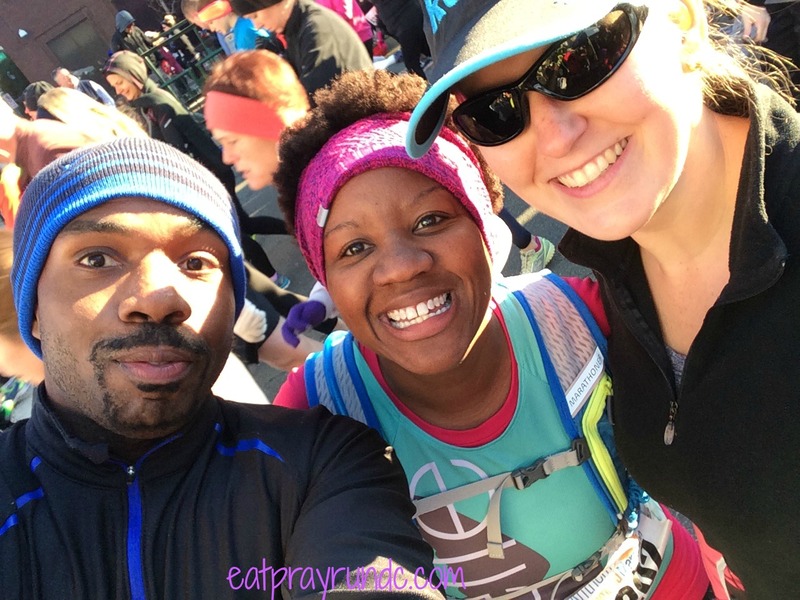 Congrats on finishing another marathon, and with your husband and friend to boot! So cool that Bart was there cheering you on! I’m glad it was fun! I haven’t seen your other posts, so I will definitely check in tomorrow to find out what happened in the rest of the race! thanks jennifer! i can’t believe i’ve run 3 marathons in the space of a year! Girl the suspense! I can’t! Sportbackers puts on SUCH organized races in Richmond every time! I love them! lol – they really do put on great races!! Congrats on the marathon!! Any marathon is an accomplishment even if it doesn’t go as planned! So cool about seeing Bart! Looking forward to reading the rest! So proud of you – now you’ve left me hanging and I need to read tomorrow as soon as you post it! Cynthia @ You Signed Up For WHAT?! recently posted…Taper Time! MCM Mama recently posted…Join me for some holiday challenges! Congrats on marathon#3 – sorry all didn’t goes as you’d hoped but definitely a great thing that you got to finish with your husband. And very cool about Bart Yasso! Way to go! I truly admire marathoners. I enjoy running but 26.2 is not in my wildest dreams! Congratulations and I can’t wait to read about the rest! Will you be coming to Philly this weekend? I met Bart when I went to one of his seminars before the VA Wine Country Half Marathon a couple of years ago. The next day, my husband ran along beside him for several miles before he realized who he was! 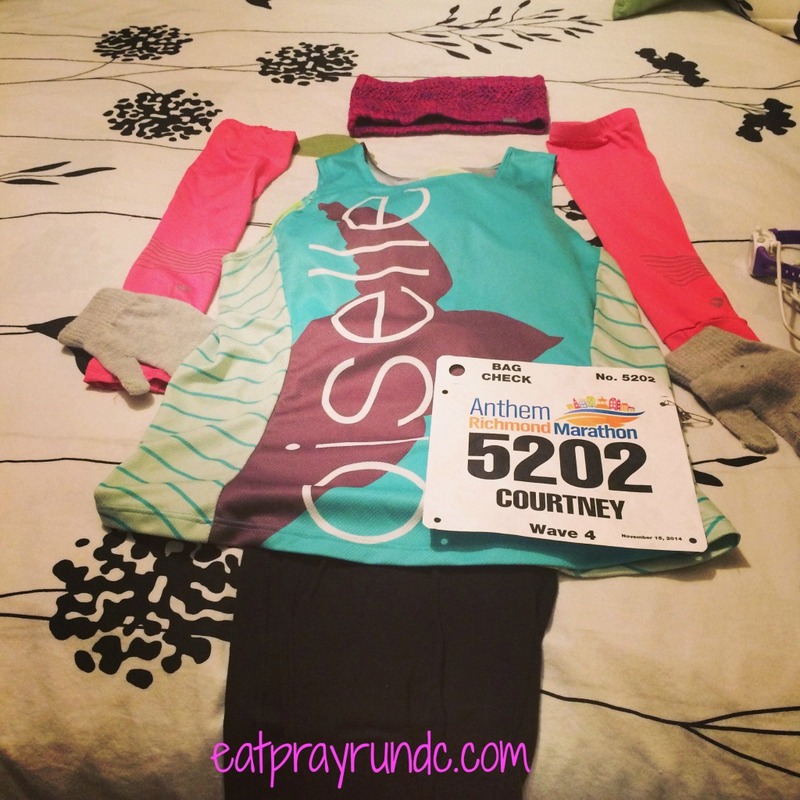 Debbie @ Deb Runs recently posted…Happy Hug A Runner Day!